Over at The Friday Mashup this week the challenge was to make a christmas project using non-christmas stamps and add a messy technique. I thought this challenge sounded like so much fun, so I began browsing my stamps to figure out what to use. I came across my Reason To Smile set and figured the flower head could pass for a wreath. I stamped it in Wild Wasabi, punched it out with my 1 3/4" circle punch and layered it on an oval cut Designer Frame. I fussy cut three little flowers from that same set, after I stamped them in Real Red, then topped them off with rhinestone centers. For the messy technique part, I ran a piece of white through the Big Shot using my Holiday Frame EF and then cut it out in a big oval with my Creative Memories oval cutting system. I dropped a bit of sparkle gel to a scrap paper, ran my brayer through it and rolled it right onto the embossed image. I like the way it turned out! I finished everything off with some Wild Wasabi photo corners with added bling and a sweet gingham ribbon. Thanks for taking a peek and have a spectacular day! 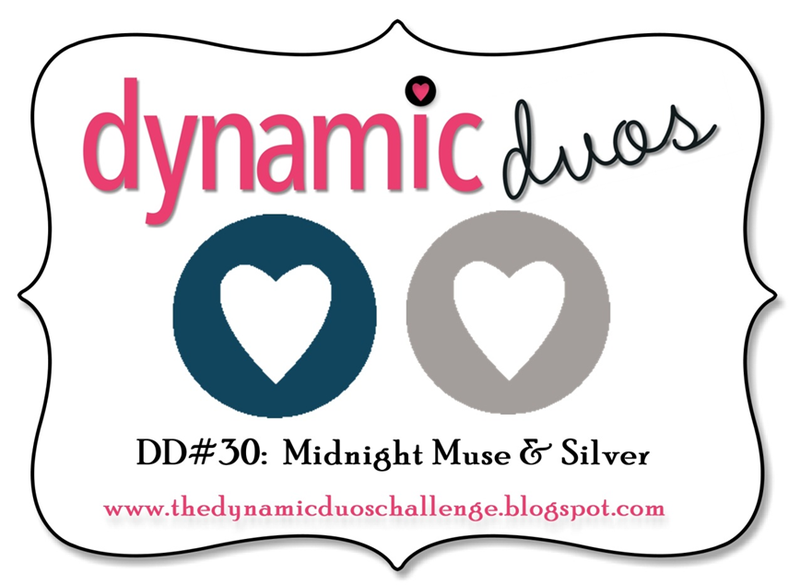 This is my design team card for this weeks Dynamic Duos Challenge #30 using Midnight Muse and Silver. I have to say thay Midnight Muse is one of new favorite colors! All the new In-Colors this year are super fun! 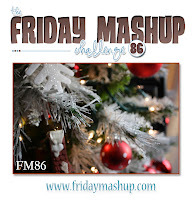 Make sure you check out the blogs of the other design team members! I tried to stay true to the challenge this week using only white as an extra color. My jumping off point was this fabulous snowflake punch strip, which was made with a tool called the Fiskars Advantage Punch System. The tool belongs to a friend of mine and she was gracious enough to let me take it home and play with it for a few days. I figured it would be perfect to use the snowflakes in this challenge. 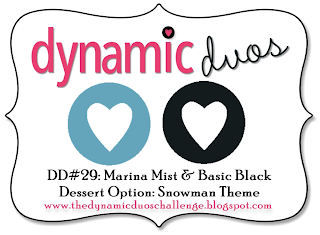 Once I had my snowflake theme in place, I added the other elements from there. Thanks for taking a peek and have a wonderful Saturday everyone! Today's card comes by way of The Paper Players Challenge 122 & Case Study Challenge 118. 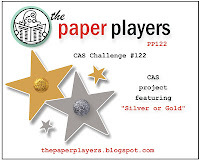 PP122 says to use gold or silver. I chose to use both! 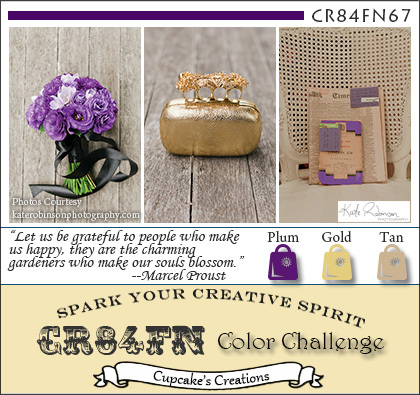 After browsing the inspiration cards from the design team, I noticed I was drawn to the ones that used both of these rich colors. I used the CSC118 as my layout inspiration. I embossed the large snowflake from Snowflake Soiree in gold on a piece of whisper white cardstock. Next I stamped and embossed the small snowflake in silver on a piece of vellum. I added the word Joy from the set The Sounding Joy to the middle of the vellum and embossed that again in gold. I added the sentiment banner, some silver braided trim, and a gold library clip to finish it all off. Thanks for taking a peek and have a sparkly day! Happy Thanksgiving everyone! I hope you are surrounded by friends and family celebrating this thankful day! I sure do have much to be thankful for! 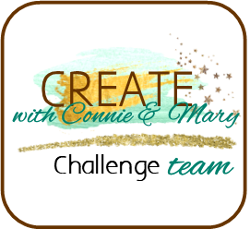 This card is for Create with Connie and Mary 227. The challenge was to make a special shaped card using framelits or dies. I pretty much stayed true to the sketch. I used the Bells and Boughs set and colored these pretty poinseittas pink. This makes me think of my mom who loves poinsiettas. She had a very pretty pink plant that she was able to keep around for a long time. Me, I've never been a plant house plant person and can't seem to keep them alive, so I admire anyone who can! I watercolored the image after stamping it in Stazon ink on watercolor paper. I layered it on a piece of Champagne Glimmer paper and then on the main card base of Primrose Petals. I ran the base top through my Big Shot using the Lacy Brocade EF, placed a couple of strips of Primrose Petal DP, then finished everything off with an always artichoke seam binding bow and some pearls. It's been a long time since I participated in a Mojo Monday challenge. When I saw the sketch this week, I was inspired to create something to go along with this stamp. I had a request from a friend to make a victorian christmas card. Now, victorian style isn't really my thing so I didn't think I owned anything I could use. However, as I started digging through my old, old stuff....and I mean OLD....I found a hand-me-down stamp set that I recieved from my MIL. She tried her hand at stamping and had purchased this Inkadinkadoo victorian style christmas set about 17 or 18 years ago. Aha! I DO own something victorian! I picked this little image of two children sleddin, set to work and this is what I ended up with. Victorian to me is mauve colors, lacey things and antique or vintage. 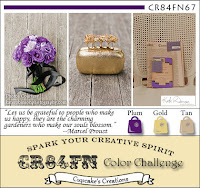 Stampin' Up's new In-Color, Primrose Petal, fit the bill for the mauve part. I paired it with Blushing Bride ink and ribbon, along with a Sahara Sand & cream colored retired designer paper that came out a few years back. (I can't recall the name of it for the life of me!) The pattern of the paper reminds me of snowflakes and mimics the snowflakes in the image. I added a little texture and some sparkle along with crochet trim and antique brad and I love, love, love the results! I'm excited for my friend to see this card. I hope she likes it as much as I do! Thanks for taking a peek and have a glorious day! This card was created for Pals Paper Arts 147 and CR84FN 67. There's not much to say about this card other than it's not my favorite. I think I just have trouble with the color purple. I tried to create something pretty, but I'm just not feeling it. Maybe someone else can appreciate this one more that I can. 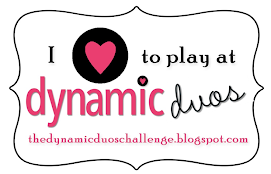 Good Saturday morning everyone and welcome to another great challege from Dynamic Duos! 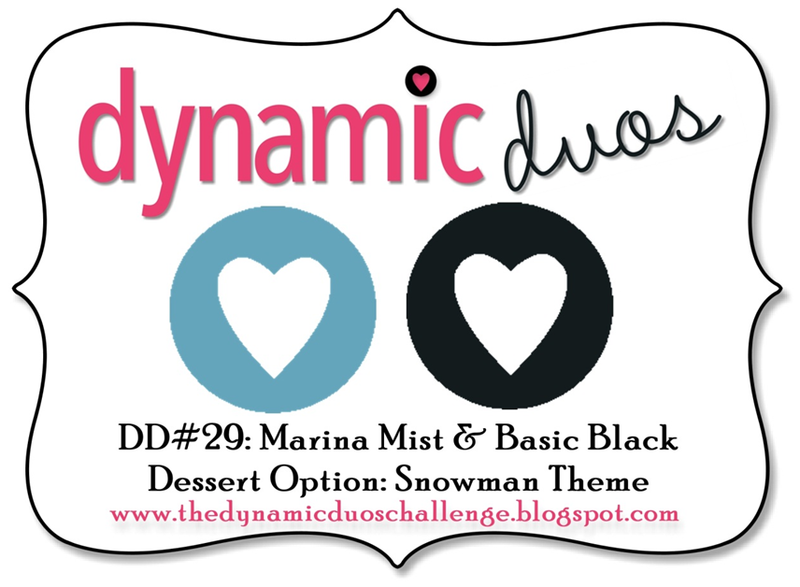 This weeks challenge uses Black and Marina Mist with a dessert option to add a snowman. Believe it or not, I don't own any snowman stamps. There have been many I've looked at at loved but never purchased! I was surprised when I looked through my stash and didn't find one. So, I used the very thing snowmen are made from....snowflakes! How's that for a stretch! I started out with the negative space snowflake from a previously cut piece of silver glimmer paper. I hate to throw away any of that glimmer paper because you never know when your gonna need a scrap. I think this worked well, after I mounted it on a black piece I cut with my spellbinders die. I layered on another snowflake, from the retired Northern Frost decorative strip die, and then added the whole thing to a white scalloped square. 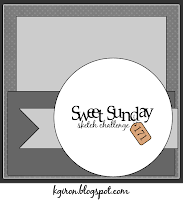 I used the Sweet Sunday Sketch #171 for my sketch inspiration. I grabbed a peice of retired To The Nines designer paper, and added a strip of black that I ran through my snowflake embossing folder, and voila'...I had my backround! I love that DP. I bought a bunch of it when it retired and have used it lots and lots! The next thing I did was add the banner behind the main image panel. I started off with just plain Marina Mist, then added a little piece of more silver glimmer. I went back and forth trying to decide if I should keep the silver piece before finally calling myself crazy for even considering not adding it! I love glitter...I can't believe I even doubted adding it! Lastly, I added the tiny Merry tag and an antique faceted button strung with some silver cord. I hope you like it! Check out what the other designers have come up with....everyone is sooooo talented and they are sure to provide you with ample inspiration! This pretty little card is for Nacho Average Challenge #20 and Freshly Made Sketches #61. I knew I loved Midnight Muse and Baja Breeze together, but to add in Summer Starfruit too? Hmmm, I don't know. I looked at the designers for inspiration and saw this card by Rose. Blue poinsiettas was an idea I had rolling around in my head for a while and then I saw Rose's card....I loved it! That was it.....I had to try it for myself! I actually love the Summer Starfruit sprigs coming out of my masked poinsiettas too! 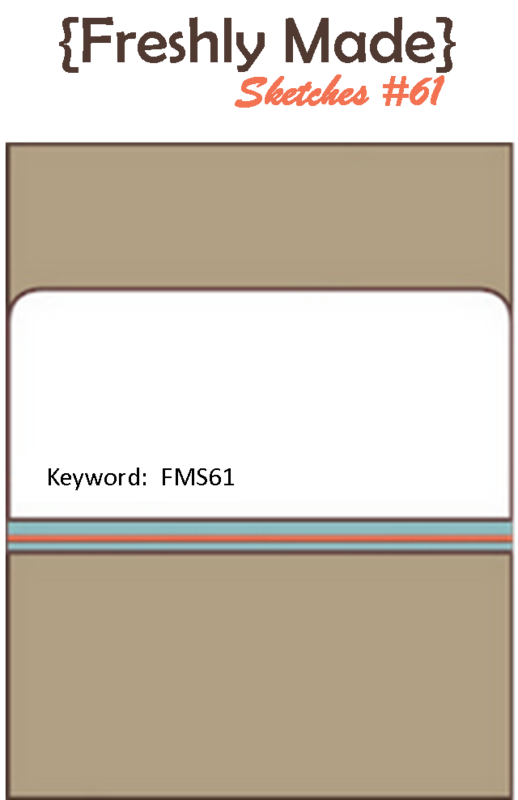 The sweet, simple sketch from FMS this week was a great match for this card. I dry embossed the base card with the Petals A Plenty EF and sponged on some of the new Illuninate ink from the SU Holiday Catalog. It adds a bit of shimmer. I added a sliver of Baja Breeze behind the main panel, a strip of Midnight Muse ribbon and topped it off with a Baja Breeze corduroy button. Lastly, I sprinkled on some Dazzling Diamond glitter, because everything is better with glitter, you know! Thanks for taking a peek and have a dyamite day! 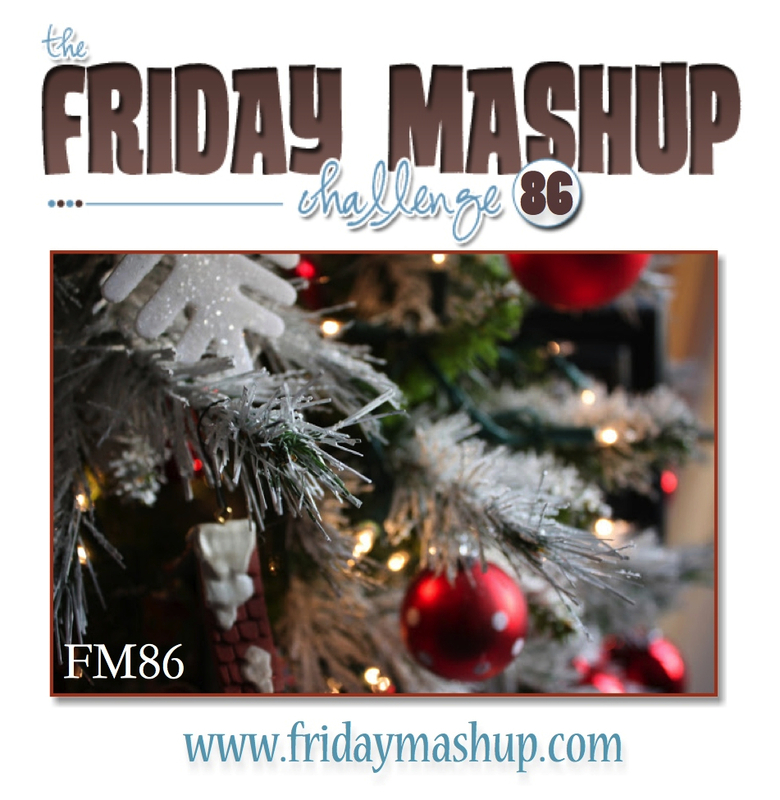 Today's card is for Create With Connie and Mary #226 and also Fab Friday #6, which were almost identical! I also used a sketch challenge from Nacho Average Challenge, but missed the cutoff for that challenge. My computer went down with a virus and needed to go to my trusty computer lady. Thank God she could fix it! She was quick too, but we had a major winter storm and the roads were horendous, so my computer was gone for a few more days than it should have been. The virus was called something something FBI. One day we heard about it on the news, the next day we had it on our computer. If anyone else gets it out there in computer-land, make sure you get you computer to someone who can help you ASAP! Enough about that....let's get back to more important things, like cardmaking! I used, for the very first time ever, my Bordering On Romance stamp set. I've looked at this set so many times, but always decided that I did't need yet another flower stamp set. I finally caved and ordered it. I also took another wack at watercoloring with the aqua painter. I'm loving this way of getting the color onto a stamped image....it's so simple! The one thing I'm didn't like about this card is the time it took to punch out all the little pieces out of the Doily die. I'm not sure if mine is defective or what, but it sure is frustrating using that thing....and this project was doily times two! It took me forever! I trimmed off the outer portion of the doilies to make them fit onto the card base. This card gives me a grandma kind of feeling with the addition of the crochet ribbon and pearls along with the doilies. I spritzed the main image with shimmer spray to give it some extra prettiness! Hello everybody! 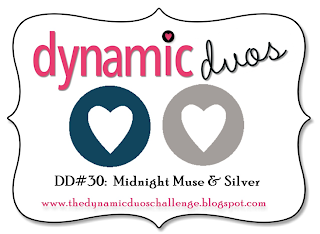 This is my second post as a Dynamic Duos design team member. I'm so very excited to be a part of all of this! 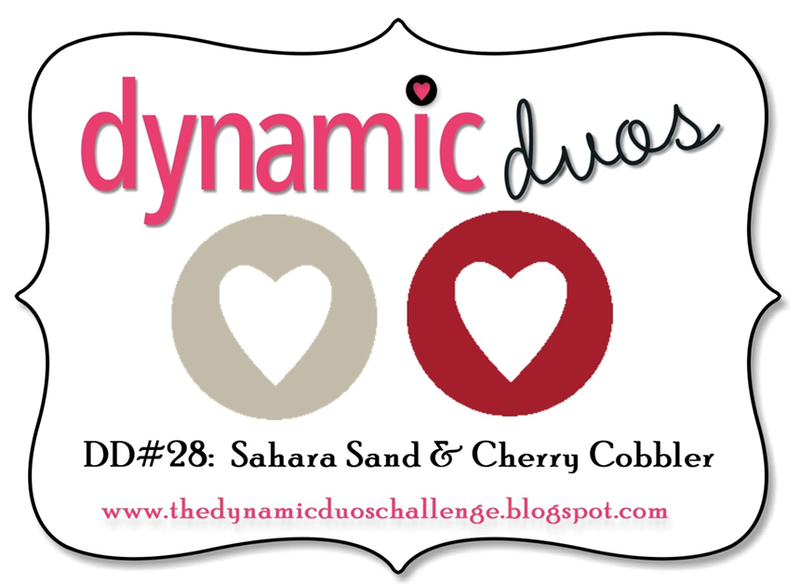 The challenge this week is to use Cherry Cobbler and Sahara Sand. The rules say that neutrals are welcome, so I added Early Espresso to mine. However when I read through the rules again, I realized that it says black, white, vanilla, skin colors and craft are welcome.....maybe espresso isn't considered a neutral? I'll need to check into that. In the future I will be more careful and try to stick closer to the main colors. 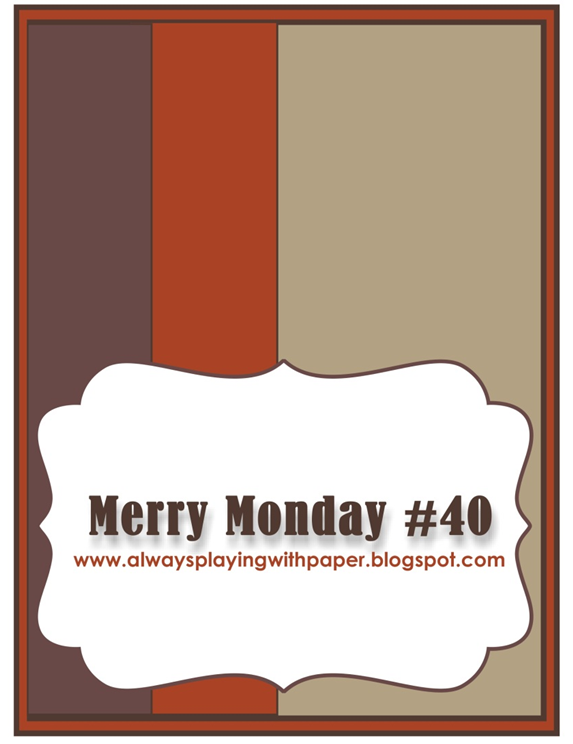 I also incorporated the sketch from Merry Monday #40 . I flipped the sketch on it's side. I had a lady ask me to make a christmas card for her mother and she wanted an oldish, Thomas Kincade feel. I just purchased the Christmas Lodge single tree stamp and felt it might be a good fit. I'm not a fan of two papers butted up next to each other without a ribbon or something to cover the seam, so I added a couple strands of espresso bakers twine, tied into a bow, to cover the seam. I also used the lace ribbon to add to the vintage feel. I hope she enjoys her handmade christmas card! Thanks for taking a peek and have a magnificent day! 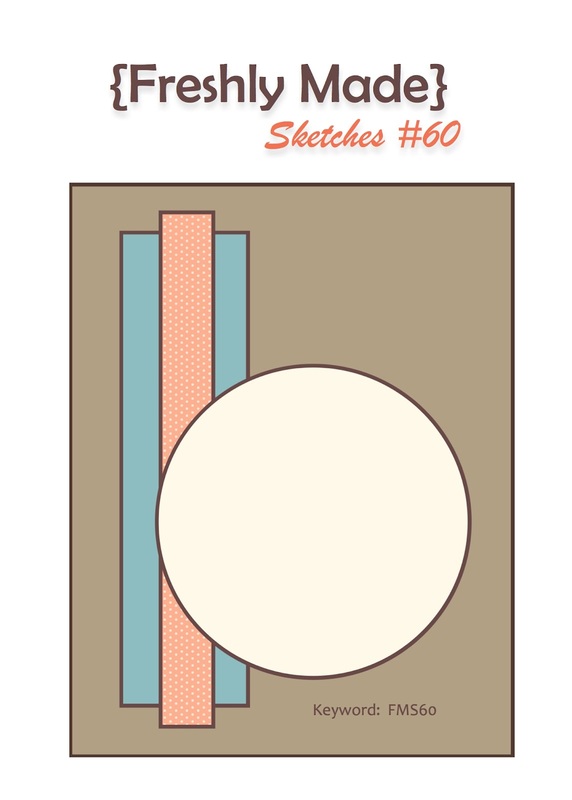 This pretty little christmas card is for Freshly Made Sketches #60. This is a fun and simple sketch that you could do anything with! 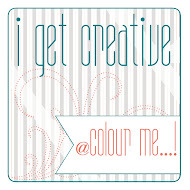 I decided to try my hand at watercoloring with the watercoloring brush I just got in my latest Stampin' Up shipment. It was fun and quick! After the image dried, I darkened up some areas with a marker. I spritzed the main image panel with Shimmer mist, and again, I wish it would show up better in the pictures. This accent totally makes the whole card special! I knew I wanted to make the bells blue, so the color palette came together from there. The Cherry Cobbler backround piece is one I had laying around my desk...a reject from another project. I think it worked nicely for this one! I love it when that happens! I also adore the new christmas Festival Of Prints designer paper pack. There are so many patterens to choose from! This one happens to be leftovers from another card I made, only I used the other side. Thanks for taking a peek and have a cozy day! 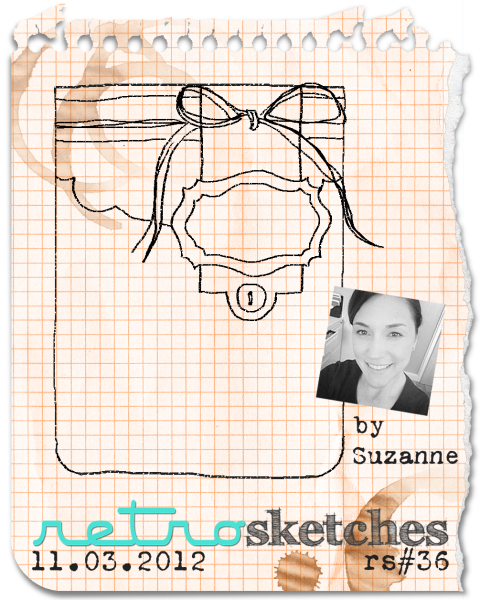 This card is for Retro Sketches 36. 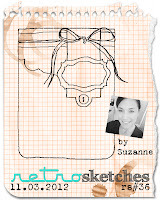 I fell in love with the sketch the moment I saw it and will be using it many, many more times! There are so many different directions you could go with this! I'm also in love with the color combo of pink and navy. For this card I used Primrose Petals and what I thought was Midnight Muse, but after closer examination turned out to be Night of Navy. Whatever, it's navy blue and I like how it turned out! The happy birthday is a single stamp I just purchased from Stampin' Up. They are running a promotion right now where you can purchase popular singular stamps. This one's from a set called You're Amazing. It's a great way to stock up on stamps that you would use frequently buy might not want to purchase the whole set. What a great idea. Ok. Now let's talk about the glimmer paper. It's out of this world sparkly and pretty! I love the punch it adds to a card. And, let's not forget about the fabulous Antique Faceted Buttons. Amazing. With the addition of the rhinestones, this card has bling coming out it's ears! I love it that way! I really wish the photos would do it justice....it's just sooooo sparkly! Thanks for taking a peek and have a safe and warm evening! Here in Montana we are hunkering in getting ready for a good old fashioned blizzard. I've got my supply of milk and other essentials in case we can't get to town for a couple of days! If we get snowed in that just means I get more stamping time!